Configure where to store the Radio Mobile configuration. As the SRTM data retrieval is broken because of Wine you'll need to manually download the data. 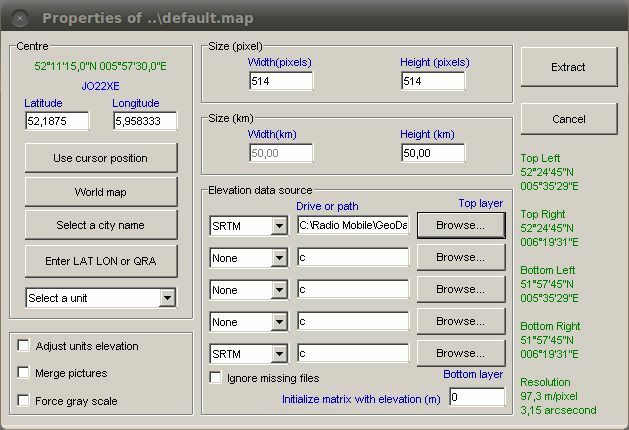 This can be done either manually or by copying downloaded SRTM data from a working Windows installation of Radio Mobile. 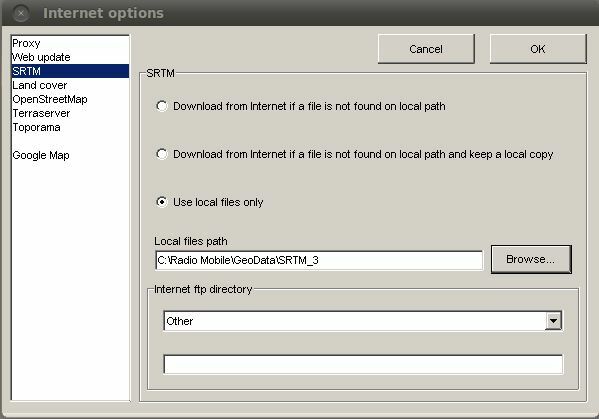 When a working installation of Radio Mobile is not available, just try to generate a map, and note down the files Radio Mobile complained it couldn't retrieve. Then download them manually, and extracted the contents of the .zip files to the SRTM directory defined in the "Elevation data source" section of the "Map Properties" dialog. Radio Mobile can use several sources of cartographic maps and areal photo's. See 'Edit > Merge picures'. Some of these sources have to be enabled manualy before you can use them. To enable access to a map source you have to remove the apostrophe before the name.